Having now passed page 500 of “book 2”, the fact that book 2 is actually two books has become abundantly clear to me if the specific dividing line between books 2 and 3 has not. The topic of this post is perhaps more properly my thoughts on nearing the end of a trilogy (rather than an individual novel) since that’s what I’m actually doing. The principles do seem fairly the same to me, though, just with the stakes (perhaps the stress as well) for a series being a little bit higher. This seems rather obvious to state now, but I had to forcibly remind myself (via Twitter) that near the end of a novel is not a time to be including new ideas, insights, or events that don’t stem from or bring clarity to events that have already occurred. To do otherwise has the danger of Deus Ex Machina written all over it. But the temptation is so strong! And I’m not even sure why that is: because I’m subconsciously trying (badly) to seed a follow-up series? Because I know my characters so well now, I want to reveal to the reader all the secrets they’ve finally revealed to me? Either way, I need to cut that sh*t out. Rather than try to veer off in new directions, I need to bring this boat full circle. Every store has a point – a theme or main message that is its raison d’être. This message is illustrated over and over again throughout the course of the story – the epitome of the adage show don’t tell. But there does come a time when you have to tell it. Not necessarily in fairytale verbiage (the moral of the story is…), but at some point, it does need to be conveyed a little more explicitly than previous, usually in the form of an ah-ha moment for the main character right around the climax. For me, that ah-ha moment was agonizing to come up with. It only had to be one key sentence, but I swear writing that one sentence was harder than all the rest of the three books combined! For days during idle moments, I would interrogate my protagonist: What have you learned from all of this? This can’t have all been for nothing? Please don’t tell me it was for nothing? Finally (thankfully! ), she yielded. I’ve been on a leisurely detour from my story’s outline since early 2013, hitting most of the major sites on the original itinerary yet via roads considerably less travelled in my mind. That said, it now being 2015, I thought it might be time to curb my off-roading ways and give the roadmap another look. I have never been more afraid of developing amnesia that am I at this very moment. Actually, getting into some kind of accident that results in my forgetting everything I know is one of my most potent (and paranoid) underlying fears. But I’m still holding so much of the story’s ending in my head, if amnesia were to strike me now…. I’m no football fan, but even I can’t ignore the significance of what occurred during the final 25 seconds of the recent Super Bowl XLIX. The same thing could happen to me. Currently, I’m operating under the assumption that my story, once finished, will be an imperfect yet serviceable body of work that focused editing and revision will make publishable. But it’s still possible for it to all fall apart – for me to discover in the eleventh hour that the whole story is an irredeemable mess. If that happens, I’m most definitely going to cry. 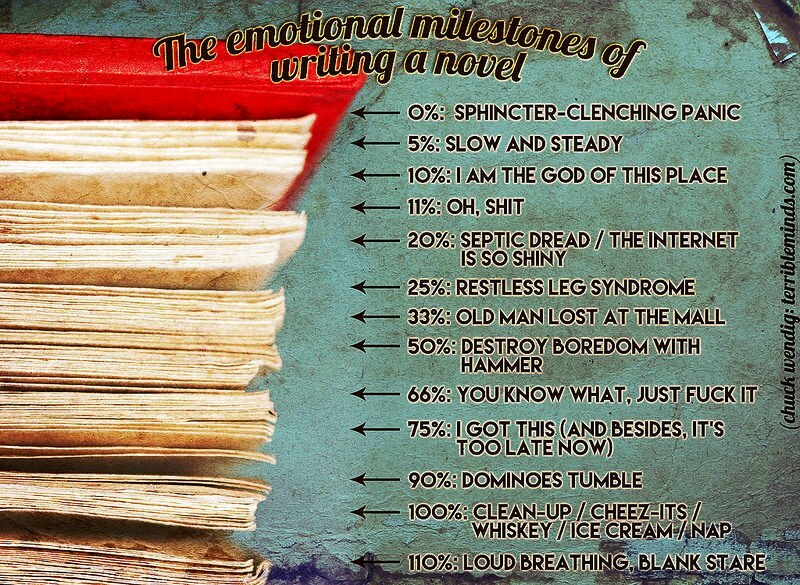 Recently, sci-fi/fantasy author Chuck Wendig created this lovely graphic of the emotional milestones of writing a novel. Personally, I feel like I’m experiencing these phases in reverse, with me hovering around the final 11%. I have a friend currently studying for a major exam at the beginning of April. Out of solidarity to her, I said I’d finish my trilogy by the same date. Will I make it? I sure as hell hope so, for this ending business is actually slowly killing me. This entry was posted in Thoughts on writing, Writing and tagged (I Should Be) Writing, Deadlines, Endings, Novel, Novel writing, Page count, Plotters vs. Pantsers, Theme, Writing milestones. Bookmark the permalink. Gak – you put this all out there, and no one responded? I’m so sorry I didn’t see it sooner. My feeds must be messed up. I’m at an earlier stage: I am very near to the end of the FIRST volume of the trilogy (it turned into a trilogy in the writing – such lovely stuff, and I was being ruthless with my discards). Anyway, first – I totally agree. ‘The end is near’ is an impossible spot for a writer to be in, because closing off the WIP means killing all those other possibilities. And we spend out writing lives LOOKING FOR those possibilities. 1) No news is good news. No Dei ex machina, even to the wrapping up of Book 1. I will write, ‘To be continued,’ at the end, but this volume is already stuffed, and, other than the few necessary tendrils to make the next volume something to be longed for, THIS one must have its own moral, its own end – and it must be right here in this volume. So no new stuff that was added after the climax. 2) There is a point. Uh huh. And I’ve been aiming toward it from the very beginning, and I’m going to go there, full speed ahead and damn the torpedos, and I don’t care if some people don’t like it, because nothing else will do. I like your idea of struggling to put it into ONE sentence, and making sure the protagonist gets to articulate it. But I’ve read too many things where, when I get to the end, the justification for having stolen great chunks of my life is that ‘stuff happens’ and the author says ‘this is like real life.’ Uh uh. No way. Real life I get from the stories in the news. I don’t read those ‘authors’ ever again. Make up your mind, support your point, and PROVE it. Make me feel your point is the only one that could reasonably be made – you control the whole experience, and if you can’t do this, you’ve failed. 3) Outline is your friend. Here’s where I have the advantage: I have never strayed (after the major reorganization of EVERYTHING) from the plot and the events that make it up. That’s one of the advantages of plotting with Dramatica. So I can’t feel your pain there, but I believe you. 4) Stay with us. Don’t disappear from this planet without finishing the work. You owe people, especially when it’s book 3 of a trilogy. Look both ways crossing the street (Pierre Curie and Margaret Mitchell left us that way), don’t let the stress give you anything fatal (if possible), and get it done sooner rather than later – really, you’ll feel better. 5) Last minute doubts. Dump ’em. That was football – and in football there is no logic, only luck (that kind of interception IS the exact definition of the Deus ex machina). And that’s why we write fiction. (Besides, football is boring.) You should have known – did know – from the beginning where you were headed. Just breathe. And do it. It is NOT going to fall apart. You’re not going to let it. There. Better now? Because if you can’t do this, how can I? The questions are the same. Wow – this comment was like an inspirational pep talk from a coach, right up to the point where you say football is boring! I’ve actually been told there’s a lot of logic to the game – my boss, who is a huge fan, describes it as “chess on a field”. But that’s beside the point. I’m pretty sure I can do this, and I might even do it on time (April 1). It will then become a question of whether I’ll ever want to do it again, to which the answer, of course, is yes. Because, like all writers, I’m not entirely sane. Make up your mind, support your point, and PROVE it. I totally agree with this. 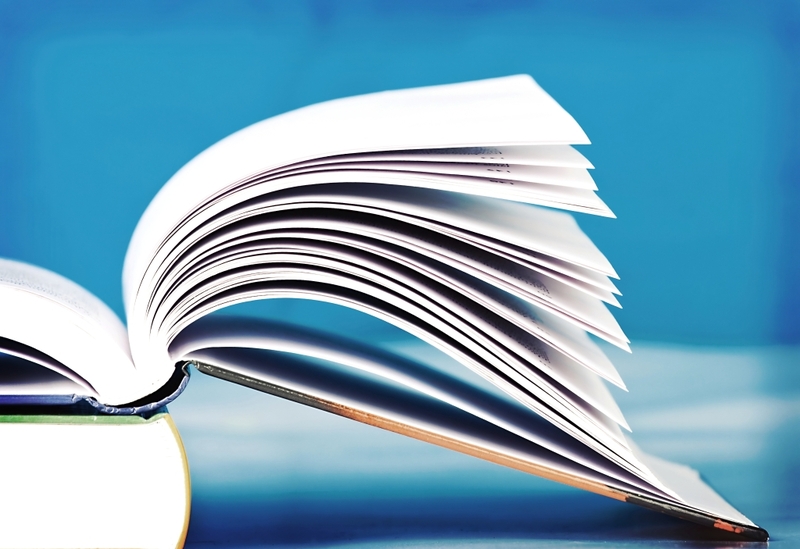 It transforms a novel into a science experiment (prove your theory) or an English Lit essay (prove your thesis). Re: football. I love watching the 5 minute summary of the game, with all the good plays. It reminds me too much of writing, otherwise: lots of behind-the-scenes work, a few good lines on the final page. We write because we can’t NOT write. If we’re lucky, and work hard, we can turn it into something shareable. You’ve accepted a deadline? Fine. But the work will proceed whether you make it or not. It takes what it takes. If you self-publish, the deadlines can be adjusted as necessary because you won’t miss all those publisher deadlines that drive writers up a tree. BTW my deadline was sometime last year – but I’m a slow writer, and it isn’t done, and I’m not putting out something that isn’t as good as I can make it – I’m not going to have that much of an oeuvre, at my age, so it has to be worth the effort. I go through that, except I think, “Wait a minute. This is terrible. It doesn’t even qualify as a story. I’m deluding myself.” And I think that about every other day. I know I can write a competent sentence, but that doesn’t mean 5000 of them in a row add up to anything. I’m not in a position to offer advice about endings, but the entertainment business axiom “leave ’em wanting more” probably has merit. Sometimes I wonder if all the brain exercise we get from writing that may help stave off dementia is worth it for the greater instances of stress and negative self-talk that seems to result. It’s not exactly a zero-sum game. “Leave ’em waiting more” is great advice not just for entertainment but life in general: don’t overstay your welcome; don’t blurt out everything that’s on your mind; make them come to you. Between writing, playing music, being intellectually curious, and trying to stay current on news and popular culture, I hope to avoid senility. Anecdotally, it seems like the people who shut themselves off and stop exploring sight, sound, and ideas are more likely to experience mental atrophy. As you know doubt assumed, however, I am not a doctor. It must be strange to have the finishing post just around the bend Janna, after such an epic project. I’d be the last one to give advice but I guess you need everything to be resolved and to leave the reader quietly satisfied. As you say, nothing in the final pages that jars with what has gone before. It is strange, Roy, but I have to keep reminding myself that I’m not there yet, so don’t get complacent now! I like your phrasing of leaving the reader “quietly satisfied”.